The coastal city of Seattle is a busy seaport and welcomes cruise ships from various lines throughout the year. The city is synonymous with popular TV shows like Grey’s Anatomy and Frasier. You can’t help but love that skyline! Some of the biggest names in the cruise line industry such as Celebrity, Holland America, Princess and Norwegian Cruise Line all use this port as the starting point for many of their ocean adventures. These cruises from Seattle are longer in nature and travellers will need to set aside just over a month (at least) in order to enjoy such a trip. South Pacific cruises make their way from Seattle to Vancouver and all the way across to exotic locations like Honolulu and Majuro before heading for Singapore with even more fabulous stops along the way. Round trips are also available but, for obvious reasons, these itineraries will mean that you need to be prepared to travel for almost two months. The added advantage is that you will be returned to your port of origin and there are plenty of stops at exotic island ports along the way! If you are fortunate enough to have all the time in the world to travel, then why not pack your bags and head out on a luxurious cruise for a couple of months or more? Starting in Seattle, make your way across the grand Pacific Ocean and stop in the island paradise of Honolulu before continuing to Fiji, Vanauatu, Sydney, Brisbane, Cairns, Bali, Perth, Melbourne, Eden and so many more! For those who don’t have two and a half months at their disposal, there are shorter itineraries that travel across the Pacific from Seattle to Australia while still offering passengers heaps to see and do. Seattle is a popular starting point for round trip cruises to Alaska. Depending on how much time you have, options include one week trips and there are longer itineraries for those with extra time to spare. Some of the main stops offered on various cruises include Victoria, Ketchikan, Anchorage, Homer and Kodiak. Cruising through the Tracy Arm Fjord and viewing the Hubbard Glacier are two of the main attractions offered by certain cruises. Not all cruise itineraries will include both of these attractions but you can be sure that, not matter which trip you choose, you will have plenty to see and enjoy! Seattle is a great place to start if you wish to cruise all the way to San Francisco and back! 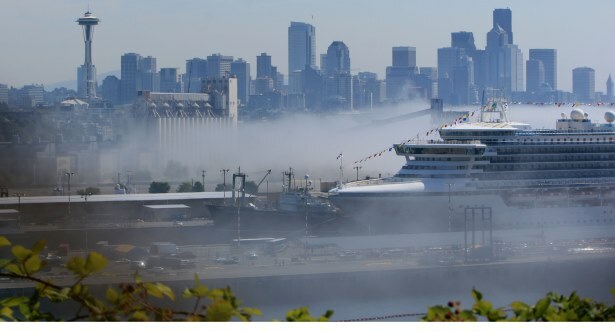 These cruises usually include more sea days than stops but it this is why passengers are encouraged to set aside some extra time to roam around and explore Seattle after their cruise. Do some last minute shopping and sightseeing before returning home.